Volition’s Saints Row series may bear more than a passing resemblance to Grand Theft Auto, but in this latest iteration it flicks the Vs at Rockstar’s flagship franchise by delivering an over-the-top, entertaining 'gangsta' romp that stands loudly and proudly on its own two feet. The open-world city layout, the theme of gangland violence, and combination of driving and on-foot combat may still be very GTA, but Saints Row: The Third most certainly has its own personality. Having already earned respect and muscled their way to the top of gangland culture in the previous games, the 3rd Street Saints are now celebrities in the town of Stilwater, selling their own line of merchandise, starring in commercials and taking time out of their busy crime-riddled schedules to film a movie. They're at the top of their game and feeling untouchable. With the world at its feet, the gang is well-equipped to throw itself head first into serious crime and, most of the time, get away with it, such is its super-star profile. The opening scene showcases an expected disregard for the authorities and follows the mob as it carries out a daring bank robbery at neighbouring town, Steelport. 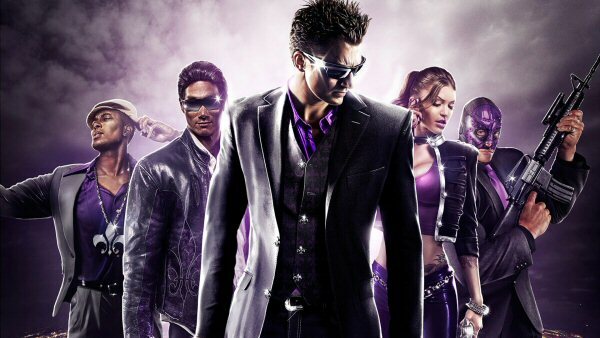 The action kicks-off with a ludicrously big bang and the Saints Row crew continue to make noise throughout the wacky and explosive main campaign as the battle for power gets very messy indeed. Feeling untouchable, the gang head to the Steelport bank wearing bobble-head masks of its leader, Jonny Gat, but the owners, a crime organisation called the Syndicate, don't take too kindly to its show of strength and arrogance. From this point forth, players are thrust right into the thick of it, in an all-out war between the two factions that spans the multiple levels of the building. The Saints, as cool as they are, still take time to sign autographs for their hostages, but the scantily-clad ladies, with AK-47s strapped around their shoulders, and the impeccably-dressed males that smash through the windows like trained SAS soldiers, ensure it’s a frenetic and memorable battle. In this furious opening, Saints Row throws countless enemies into the melee, which you can shoot down with a variety of weapons, fist-fight into submission, or use as a shield to deflect bullets from the rampant hordes. The chaotic start is topped-off with an explosive roof-top battle involving multiple helicopters, which you can take out of the sky in spectacular fashion with a well-placed RPG.